Though I didn't need yet another lipstick, I went ahead and got one because I was getting tired of wondering about it! Then last week I bumped into another colleague and as we were saying our hellos, I asked if she was wearing the lipstick that I had made a note of and she said yes. To have singled out the same product twice pretty much convinced me that I should have a go at it myself! So a few nights ago I headed into one of the stores and had the store assistant put it on me. The lipstick that's been floating around in my head (and now sits on the dressing table!) 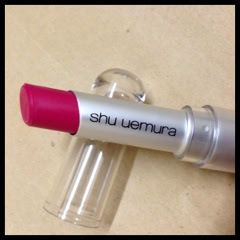 is Shu Uemura's Rouge Unlimited Supreme Matte lipstick in 376. There really is something about those pink-not-quite-pink-nor-red shades that I love. I do feel that they look good on me, and long gone the days where I'm afraid of having a bright lip for my makeup! Definitely not a colour for the faint hearted. Anyway, I'm obsessed! Haven't worn any other lipstick since I got it! And the formula is awesome too. It's matte (so it stains) and pretty moisturising and comfortable to wear. I really should stop buying lip products after getting this (and Tarte's Skintuitive Lip Tint too last week!) but I have my eyes on Revlon's Matte Balm in Unapologetic. Should I be getting that next? Eeeeeep!